So this Friday... I'm having surgery. I just had my pre-op appointment this morning, so I'm feeling a little less anxious than before - now that I know exactly where to go the day-of and what to expect, etc... but still - the idea of being put to sleep is scary! It's like you lose a good 2 or 3 hours of your life! My husband had hernia surgery earlier this year - and that was the first experience with surgery of any kind for both of us. If someone had told us this past Christmas that we both would be having surgery this year, I would have laughed. What in the world? After about a year of trying, we started initial fertility testing with my OB/GYN - whom I love. She is great. She experienced problems with infertility as well, so she's been where I've been and where I'm about to go. Well we did a bunch of bloodwork, my husband had his boys tested, and I also had an HSG. Don't ask me to spell out the formal name for that procedure - but it's a dye test to see if your tubes are open and to examine the shape of your uterus, etc. Well I'm lying there on the exam table looking at the image of my uterus on the screen and the radiologist informs me that I have uterine horns, which could mean a couple of different things. Either way - it meant my uterus was abnormal and some kind of "procedure" would have to be performed before I could carry a baby full term. My doctor later ordered an MRI to further examine the uterine abnormality. The MRI films (which are freaking weird, by the way!!) showed that I have a septum - a wall of tissue down the middle of my uterus. So the surgery I'm having Friday is to remove this wall of tissue. The MRI also revealed an ovarian cyst, which will also be dealt with AND, just for kicks, the surgeon (my fertility specialist) will check for and remove any endometriosis found. A 3-for-1 special! I DO love a bargain. 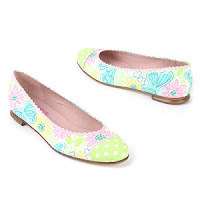 The 2-for-$79 sale is over, but Smart Bargains still has a lot of great Lilly shoes marked down to $39.98. Also Horchow is offering 20% off site-wide until midnight tonight. Enter code TODAY620 at checkout. I'm a dog person. I love dogs... more than some people even. Our two poochies are totally our pride and joy - they're truly our kids. My husband and I of course look forward to having little humans running around someday soon, but it's hard to imagine loving something more than we love our two sillies, Belly and Charlie. 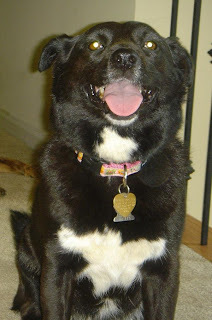 We adopted Belly, the little black border collie mix, soon after we married. She's a crazy little girl - full of energy, sass, and is too smart for her own good. A year later we adopted Charlie, an Australian shepard mix. He's pretty much the opposite of Belly... completely laid back, likes to stay indoors - preferably on the couch. The two are best friends and they clearly love each other so much. Belly is a daddy's girl and sweet Charlie is a total mama's boy. They're the perfect kids. I know non-doggie people probably think we're nuts... but our little sillies brighten our world. My mom, who is also a big dog lover, sent me a quote the other day that totally rang true... "If you've never loved an animal, then there's a piece of your heart that hasn't been touched." I couldn't have said it better! Dogs are maybe the only creatures on this earth that have absolute unconditional love for their humans. They want nothing more than to be with you, love on you and please you. Besides a new pair of shoes, dogs are about the best therapy out there. I truly believe God reveals his love in all kinds of ways... and perhaps he created "man's best friend" for this purpose. This is one of my FAVORITE new finds. 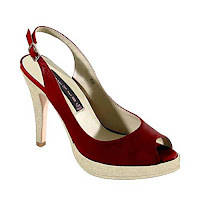 Design-your-own shoes at Steve Madden! I just received my first pair so now I can fully share the experience with others. It all started with the dream of the perfect yellow shoe. I love that yellow is so hot this year and I just had to have the perfect pair of yellow heels. I searched and searched, but couldn't find exactly what I was after. I have a few pairs of Steve Madden shoes, so at some point I wound up on his site browsing around and it was there that I stumbled upon his DYO shoe collection! How brilliant is this? I found the perfect shoe and I was able to customize every last detail - from the color, to the fabric, to the heel material - AND size. With the DYO collection, you don't have to worry about your size being sold out, because they're made just for you! And that's another huge plus with these - the DYO variety are offered in those very hard-to-find sizes like 4 and 4.5. 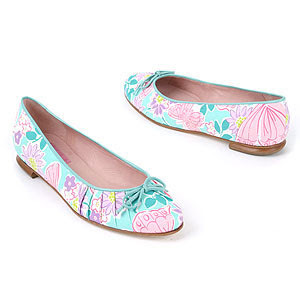 One of my girlfriends has itty bitty feet and has the most awful time finding cute shoes in her size - so this discovery has been so exciting for her because of the size availability! So after I designed my yellow pumps, I put them in my basket and checked out. Three weeks later they arrived on my doorstep - just as I had designed them and they are perfection! Yes, they do take a while to arrive - so if you're creating shoes for a specific occassion, order early! And also keep in mind that the DYO variety are NOT returnable or exchangeable since they are made just for you. So it's best to know how Steve's shoes typically fit you before ordering. For me, they are very true to size. I was so excited about this discovery that I actually emailed the Steve Madden team to send my kudos! I haven't seen anything like this elsewhere - if anyone knows of other designers with similar programs, please share! Happy shoe shopping! You'll notice soon enough that I love to chat about shopping - especially finding a killer bargain. I do a lot of online shopping - probably moreso online than in an actual brick and mortar store these days. I still love to stroll from shop to shop and gab with girlfriends along the way, but I've found that it's hard to beat some of the online deals that are out there. One of my favorite shopping services I've found is a site called www.shopittome.com - you have to check it out! Spend a few minutes to create a profile... it will ask you what kind of products you're interested in as well as all your sizing info. Then you're given an expansive list of designers and retail stores to add to your list. Lastly, you choose when and how often you want to receive emails from shopittome.com (I get mine daily!). Then you'll receive emails with links to items on sale from your favorite designers and favorite stores - in your size! They pull from a lot of different sites - including some of my fav's - SmartBargains, shoes.com, and Bluefly just to list a few... But it's all right in front of you - the stuff you want, on sale - just a click away without having to hop from site to site digging through the stuff you don't want. Now sometimes I do find some of the more exceptional bargains are sold out by the time I read the email and click on it, but more often than not, this is a great source for finding bargains on designer duds because it does all the legwork for me! Happy shopping! OK my best friend got me into this somehow... I do the occassional blog on myspace, but this seems to be a way more fun way of doing it! My musings tend to be about shopping and creative stuff... and then I sometimes find myself ranting about my latest pet peeve. This blogging thing is just a fun way to share ideas or broadcast the occassional vent session. So here I am, world!